Royal icing is an icing that dries hard and is perfect for decorating cookies or putting together gingerbread houses. Traditionally made with egg whites, it’s easy to make your own royal icing using meringue powder to avoid the worry of raw eggs in your treats. Come back next week and I’ll show you what we decorated with our royal icing! In a medium bowl, beat meringue powder and water until stiff peaks form. Divide icing into separate bowls and stir in food coloring a couple drops at a time until you get the color you want! 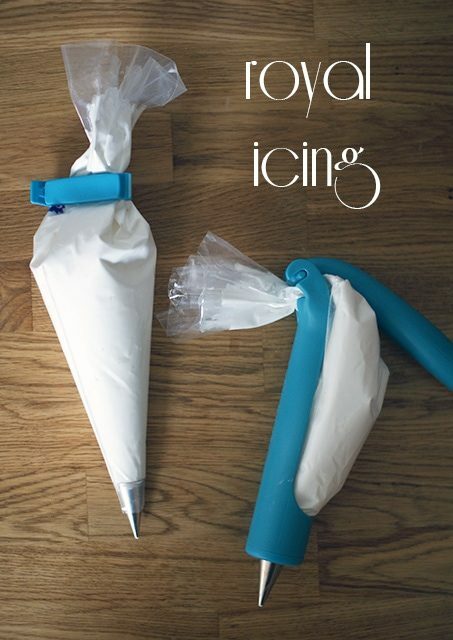 Transfer to a piping bag to decorate your cookies or gingerbread house. Add 1/8 teaspoon water at a time to thin it out or 1 tablespoon powdered sugar at a time to thicken it. Store in an air-tight container with a tight lid for up to two weeks. Note, however, that it will begin to separate over time, so you will need to beat it again if that happens. The consistency may also change with time, so if you find that it’s too stiff add more water, a teeny bit at a time; if it’s too runny, add more powdered sugar. What is that blue contraption on the right? I’ve never seen it before.